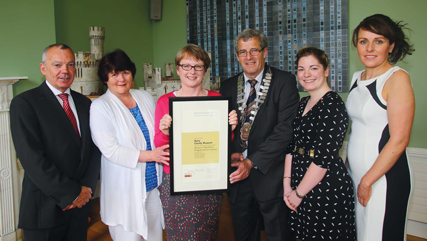 In 2013 KCM was awarded Full Accreditation in the Museum Standards Programme for Ireland (MSPI). This Programme, an initiative of the Heritage Council of Ireland, aims to benchmark and raise professional standards in the museum sector. A voluntary programme, it has attracted involvement from across the cultural spectrum, from national institutions to small volunteer-led organisations. There are thirty-four standards, divided into seven categories: Constitution and Policies; Museum Management; Caring for Collections; Documenting the Collection; Exhibition; Education; Visitor Care and Access. Twenty-five of the standards are interim and nine are full. An application for interim accreditation takes three years to complete, while full accreditation takes five years. Two Assessors, drawn from a panel of senior museum professionals based in Ireland, Northern Ireland and the UK, review each museum’s written application, conduct a site visit and submit a written report and recommendation to the Programme’s Advisory Group. This is reviewed by the Heritage Council before the awarding of accreditation. 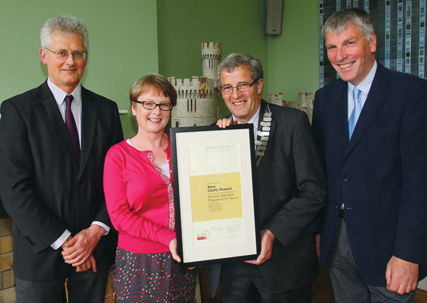 “In 2009 Kerry County Museum was awarded Museum of the Year in Ireland. The sense that high standards underpin every aspect of the Museum was confirmed by Kerry County Museum’s recommendation for Full Accreditation this year. The Museum has links with major museums and collections both within Ireland and without, and has developed a widespread reputation as a model small museum. The recommendation for Full Accreditation reflects not only huge credit on the Museum’s staff, but also acknowledges the Town Council’s Elected Members and senior managers, who clearly have been enthusiastic supporters of the Museum and its work”. KCM will apply for Maintenance of Full Accreditation in 2016.